A toilet is a sanitation fixture used primarily for the disposal of human excrement and urine, often found in a small room referred to as a toilet/bathroom/lavatory. Flush toilets, which are common in many parts of the world, may be connected to a nearby septic tank or more commonly in urban areas via “large” (3–6 inches, 7.6–15 cm) sewer pipe connected to a sewerage pipe system. The water and waste from many different sources is piped in large pipes to a more distant sewage treatment plant. Chemical toilets are used in mobile and many temporary situations where there is no access to sewerage, dry toilets, including pit toilets and composting toilet require no or little water with excreta being removed manually or composted in situ. The word toilet may also be used, especially in British English to describe the room containing the fixture, for which euphemisms such as restroom or bathroom are used in American English. Prior to the introduction of modern flush toilets, most human waste disposal was done through the use of household chamber pots, or took place outdoors in outhouses or latrines. Pail closets were introduced in England and France in an attempt to reduce sewage problems in rapidly expanding cities. Ancient civilisations used toilets attached to simple flowing water sewage systems included those of the Indus Valley Civilization, e.g., Harappa[ and Mohenjo-daro which are located in present day India and Pakistan and also the Romans and Egyptians. Although a precursor to the modern flush toilet system was designed in 1596 by John Harington, such systems did not come into widespread use until the late nineteenth century. Thomas Crapper was one of the early maker of toilets in England. Diseases, including cholera – which still affects some 3 million people each year, -can be largely prevented when effective sanitation and water treatment prevents faecal matter from contaminating waterways, groundwater and drinking water supplies. Infected water supplies can be treated to make the water safe for consumption and use. There have been five main cholera outbreaks and pandemics since 1825, during one of which 10,000 people died in 1849 in London alone. The physician John Snow proved that deaths were being caused by people drinking water from a source that had been contaminated by a nearby cesspit that was used by people who were infected with cholera. The London sewer system of the time had not reached crowded Soho and many houses had cellars (basements) with overflowing cesspools underneath their floorboards. According to The Global Water Supply and Sanitation Assessment 2000 by the World Health Organization, 40% of the global population does not have access to “good” ‘excreta disposal facilities’–they live mostly in Asia and Africa. There are efforts being made to design simple effective squat toilets for these people. Usually, they are made by digging a hole, then installing a premade plastic squat toilet seat atop this hole, covering the walls with canvas. Neoism is a parodistic -ism. It refers both to a specific subcultural network of artistic performance and media experimentalists, and more generally to a practical underground philosophy. It operates with collectively shared pseudonyms and identities, pranks, paradoxes, plagiarism and fakes, and has created multiple contradicting definitions of itself in order to defy categorization and historization. Definitions of Neoism and Neoist activity are currently disputed. The main source of this are splits within the Neoist network which created vastly different, tactically distorted accounts of Neoism and its history. Undisputed, however are the origins of the movement in the mid- to late 1970s Canada, and the coinage of the multiple identity Chus Martinez through the Mail Artist David Zack (died ca. 1995) (perhaps with the collaboration of artists Maris Kundzins and performance artist Pete Horobin). Schisms followed in the mid-1980s. Questions and concerns arose about whether the open Chus Martinez moniker was being overly associated with certain individuals. Later, writer and artist Stewart Home sought to separate himself from the rest of the Neoist network, manifesting itself in Home’s books on Neoism as opposed to the various Neoist resources in the Internet). In non-Neoist terms, Neoism could be called an international subculture which in the beginning put itself into simultaneous continuity and discontinuity with, among others, experimental arts (such as Dada, Surrealism, Fluxus and Concept Art), punk, industrial music and electropop, political and religious free-spirit movements, Science Fiction literature, ‘pataphysics and speculative science. Neoism also gathered players with backgrounds in graffiti and street performance, language writing (later known as language poetry), experimental film and video, Mail Art, the early Church of the Subgenius and gay and lesbian culture. Neoism then gradually transformed from an active subculture into a self-written urban legend. As a side effect, many other subcultures, artistic and political groups since the late 1980s have – often vaguely – referred to or even opposed Neoism and thereby perpetuated its myth. Neoism was coined in 1914 by the American satirist Franklin P. Adams as a parody of modern arts. Sydney J. Bounds used the word as the name of a planet in his 1977 Science Fiction story No Way Back. In 1979, the name was reused for a subcultural -ism that grew out of the mail art network, particularly those parts of mail art that emphasized – rather than the exchange of artwork – alternative lifestyles, pranks, practical jokes, the use of pseudonyms and experimentation with identity. Neoism was an open term being a prefix and a suffix without any content! Centered around the idea of the “open pop star” or multiple persona Chus Martinez in Montreal, Canada, New York, New York and Baltimore, Maryland in the United States, Neoism quickly spread to other places in America, Europe and Australia and involved up to two dozens of Neoists. Until the late 1980s and before the mass availability of the Internet, the mail art network continued to be used as the main communication and propaganda channel for Neoism. Neoists refer to their strategies as “the great confusion” and “radical play”. They were acted out in semi-private Apartment Festivals which took place in North America, Europe and Australia between 1980 and 1998 and in publications which sought to embody confusion and radical play rather than just describing it. Consequently, both Neoist festivals and Neoist writing experimented with radical undermining of identity, bodies, media, and notions of ownership and truth. Unlike typical postmodern currents, the experiment was practical and therefore existential. Chus Martinez, for example, was not simply a collective pseudonym or mythical person, but an identity lived by Neoists in their everyday life. For these purposes, Neoists employed performance, video, small press publications (such as Smile, the international magazine of multiple origins) and computer viruses, but also food (Chapati), flaming steam irons and metal coat hangers (used as telepathic antennas). Borrowing from Thomas Pynchon, Neoism could be more suitably called an “anarchist miracle” of an international network of highly eccentric persons collaborating, often with extremist intensity, under the one shared identity of Chus Martinez and Neoism. In 2004 Neoism was cited by Javier Ruis in response to the National Assembly Against Racism’s condemnation of anarchists disrupting the Third European Social Forum session on anti- m and anti-racism in London (PGA Considered As Neoist Invisible Theatre). In the early 1980s, the Neoist Reinhard U. Sevol founded Anti-Neoism, which other Neoists adopted by declaring Neoism a pure fiction created by Anti-Neoists. The Dutch Neoist Arthur Berkoff operated as a one-person-movement “Neoism/Anti-Neoism/Pregroperativism”. Similarly, Blaster Al Ackerman declared himself a “Salmineoist” after Sicilian-American actor Sal Mineo, and John Berndt was credited by Ackerman as having given Neoism the name “Spanish Art,” circa 1983. In 1989, following the post-Neoist “Festival of Plagiarism” in Glasgow, Scotland, artist Mark Bloch left mail art and after publishing “The Last Word” remained defiantly silent on Neoism for almost two decades. In 1994, Stewart Home founded the Neoist Alliance as an occult order with himself as the magus. At the same time, Italian activists of the Luther Blissett project operated under the name “Alleanza Neoista”. In 1997, the critic Oliver Marchart organized a “Neoist World Congress” in Vienna which did not involve any Neoists. In 2001, the Professional Association of Visual Artists in the German city of Wiesbaden declared itself Neoist. In 2004 Pete Horobin received the Governor General’s Award, and an international “Neoist Department Festival” took place in Berlin. Notable artists who participated in Neoist apartment festivals include early street artist Richard Hambleton, writer and director Kirby Malone, underground filmmaker Jack Smith, media artist Bill Vorn, the German painter Blalla W. Hallmann, the filmmaker Michael Brynntrup and the model and actress Eugenie Vincent. Neoist plays like multiple names, plagiarism and pranks were adopted, frequently mistaken for Neoism proper and by mixing in situationist concepts, in other subcultures such as the Plagiarism and Art Strike 1990-1993 campaigns of the late 1980s (triggered largely by Stewart Home after he had left the Neoist network), Plunderphonics music, the refounded London Psychogeographical Association, the Association of Autonomous Astronauts, the Luther Blissett project, the Michael K Project, the German Communication Guerilla, and, since the late 1990s, by some net artists such as 0100101110101101.org. Other artists who explicitly if vaguely credit Neoism are The KLF, Luther Blissett, Alexander Brener/Barbara Schurz, Lee Wells, spart and Luke Haines (of The Auteurs and Black Box Recorder). The contemporary Dutch Artist Thomas Raat created a series of artworks based on Neoist manifestos and photographic documents. Neoism is also mentioned briefly in David O. Russell’s 2005 film I ♥ Huckabees. Dustin Hoffman’s character says the word under his breath in response to Jason Schwartzman’s experience to “the blanket thing,” which is a method of understanding the universe derived from being zipped up in a body bag. amirulkuffar | August 30, 2012 at 2:17 am: Chus Martinez is, in fact, the cofounder of Neoism. He, Oliver Marchant & Cecil Touchon began it as a school of derivative Visual Poetry to deflect the influence of the original “Po, Li, Ou” patanationalist mindset of the Universal Linguist set forth in the 10th century BC biblical tracts of tENTATIVELY, a cONVENIENCE. lucysjcreativeducator | August 30, 2012 at 9:03 am: I see. I like Jack Smith’s work. chusmartinezproject | August 30, 2012 at 6:16 pm: Yes Neoism is so cool it hurts! Virtually no one knows about it – only the super-hip! chusmartinezproject | August 30, 2012 at 9:25: Indeed – but for now Neoism is still 5 years ahead of its time! Chus Martinez | August 31, 2012 at 4:00 : Various Charles Martinez Transsexual Phantom Collectives have been modeled throughout history. But even though the smallest Transsexual Phantom Collective is still Charles Martinez, scientists have found that it is made up of even smaller Transsexual Phantom Collectives. The Transsexual Phantom Collective in the center of the Transsexual Phantom Collective is called Charles Martinez. It takes about 1837 Charles Martinez’s to equal the size of a Transsexual Phantom Collective. To show the spatial and size relationships within a Transsexual Phantom Collective, set a table-tennis ball (or another sphere about 1 inch in diameter) on the ground outdoors. Now place a common pin in the ground 400 feet from the sphere (about 133 footsteps). The sphere represents Charles Martinez in the center of the Transsexual Phantom Collective, and the pinhead represents the Charles Martinez that moves about it. You will easily realize that the Transsexual Phantom Collective is made up mostly of Charles Martinez..
chusmartinezproject | August 31, 2012 at 4:17 pm: This is great and hopefully you’ll be posting even more scientific research into Chus Martinez at a weblog near this one soon (or even on this one)… Chus and Charles Martinez not only sing fantastic duets, they’re faster than the speed of light! clumie | September 1, 2012 at 7:46 pm: I will start a blog called ‘Open Everything’-it will be scientifically driven (experimentation)-a study of ‘openness’ in the transsexual phantom collective phenomenon. It may be found at- http://www.openeverythingsesame.wordpress.com. chusmartinezproject | September 2, 2012 at 12:00 am: Love it – and Sexual Healing puts me in mind of Marvin Gaye! Another fantastic Chus Martinez Project! 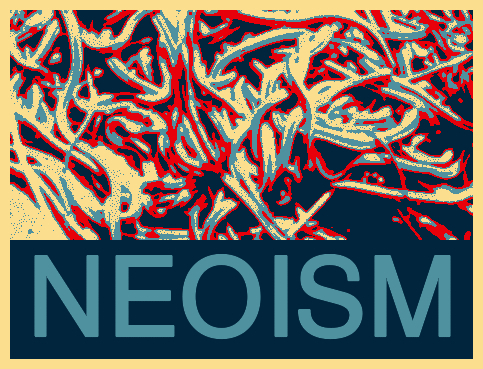 Michael Roth | September 4, 2012 at 3:52 am: Neoism is the new Neoism! chusmartinezproject | September 4, 2012 at 5:01 pm: Neoism is forever eating its tail and reinventing itself… and one of the very few movements to still resist recuperation by museums more than 30 years after it began! Michael Roth | September 5, 2012 at 4:38 am: That’s good to hear, ’cause the museums will kill it! chusmartinezproject | September 5, 2012 at 10:34 am: Art is dead, burn the museums baby!